With over 30 years of experience designing outfits for little ones, we’ve created a distinct style that combines contemporary designs with a vintage influence. Combined with the finest materials sourced from around the world and superior hand-craftsmanship, we’re able to create timeless outfits that families will treasure. Our Tessa romper collection is the perfect baby outfit for a Spring or Summer event. Made with vintage pink champagne silk, its a lovely feminine color while still being classic and graceful. Made to fall mid-thigh to knee length so she is elegantly styled but still your baby girl. The collection is special because of the attachable silk skirt, turning your baby romper into a beautiful silk baptism gown. Two outfits in one! The Adeline Dress is made with a stunning 100% cotton lace in light ivory, selected by our designer for its soft feel and intricate detailing that makes this dress a standout. Delicate silk ribbon ties and matching bloomers complete the look dress set. This beautiful collection is the combination of simple and elegant design with the sweetest vintage touches - perfect for special occasions such as bringing home baby or her Christening day. Within our Jessica collection you will find a stunning heirloom length christening gown in ivory silk and a traditional newborn layette in a luxurious pima cotton. Both designs feature our champagne embroidered netting across the bodice, an intricate pastel floral and leaf applique with added pearl beading and light pink silk ribbon bows. 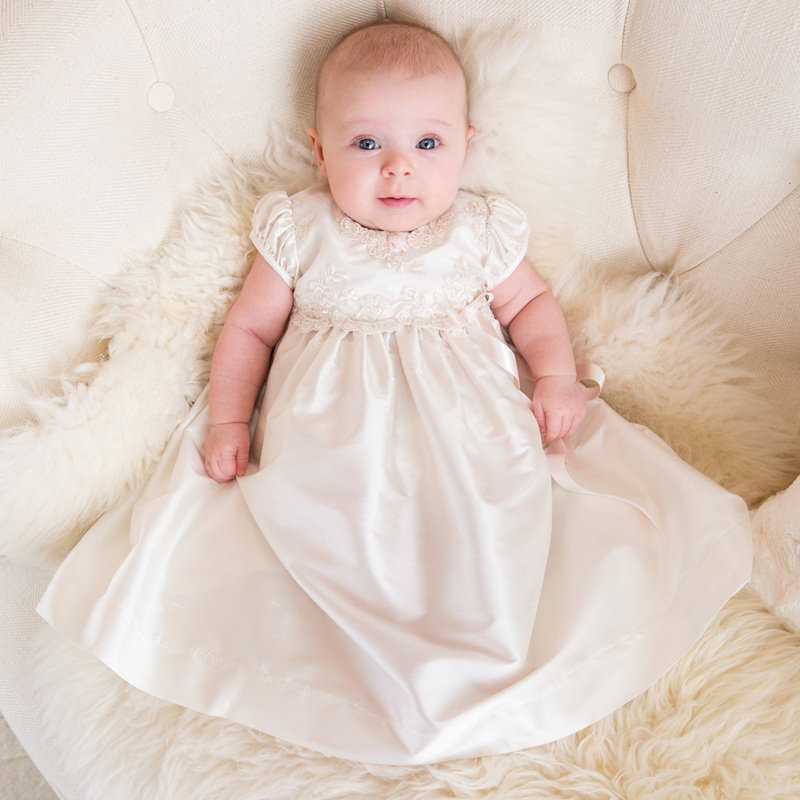 The Victoria collection is one of our newest collections for girls, featuring our heirloom Victoria Christening Gown. Featuring a stunning floral lace with unique eyelash lace hem, that is designed to fall well past her toes. 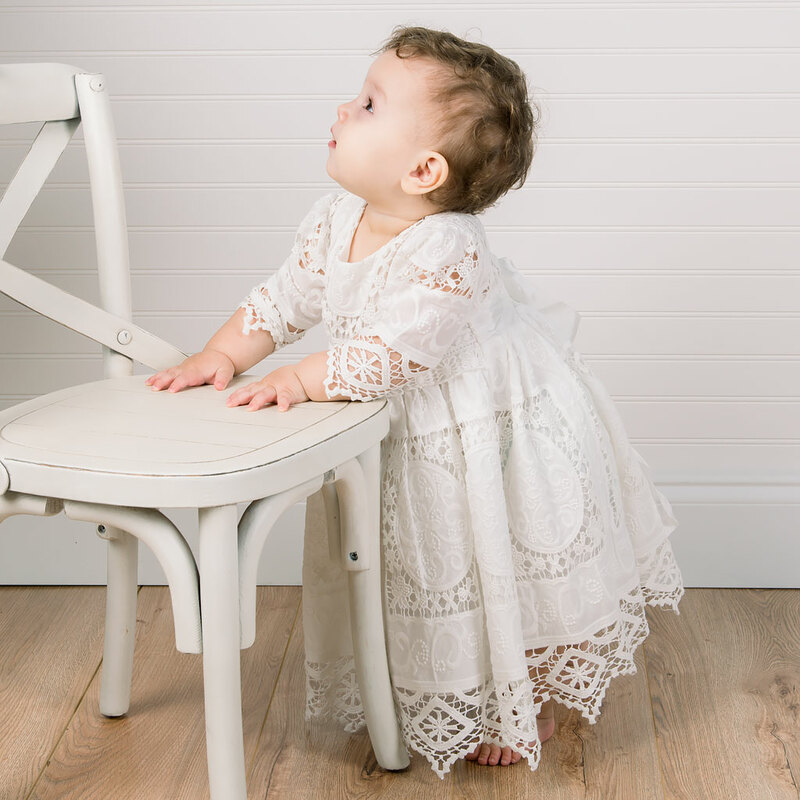 This unique romper for baby girls is made with an intricate floral lace in light ivory. Sheer cap sleeves add an adorable accent, and the sash at the waist can be tied for a fit that seems as though its custom to her. The hidden snaps at the legs and shell buttons on the bodice make it easy to change her into her gorgeous outfit. 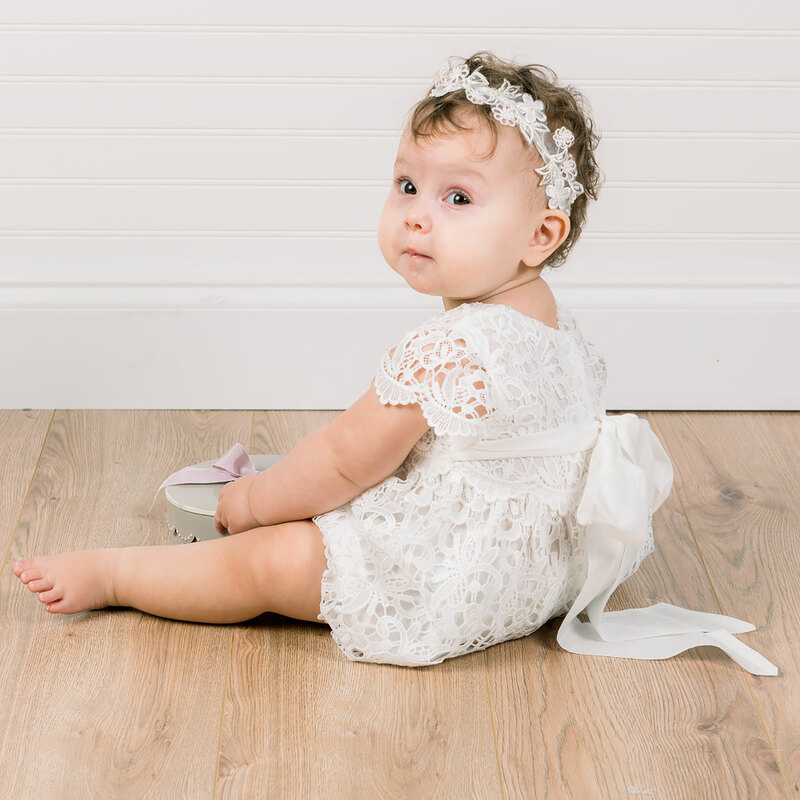 Our Grace White Christening Collection offers a beautiful selection of outfits and accessories for Baby Girls in a stunning white lace. This collection features our Grace White Lace Romper, crafted with a white venice lace. Lace cap sleeves and a silk tie sash are thoughtful details that add to the design. 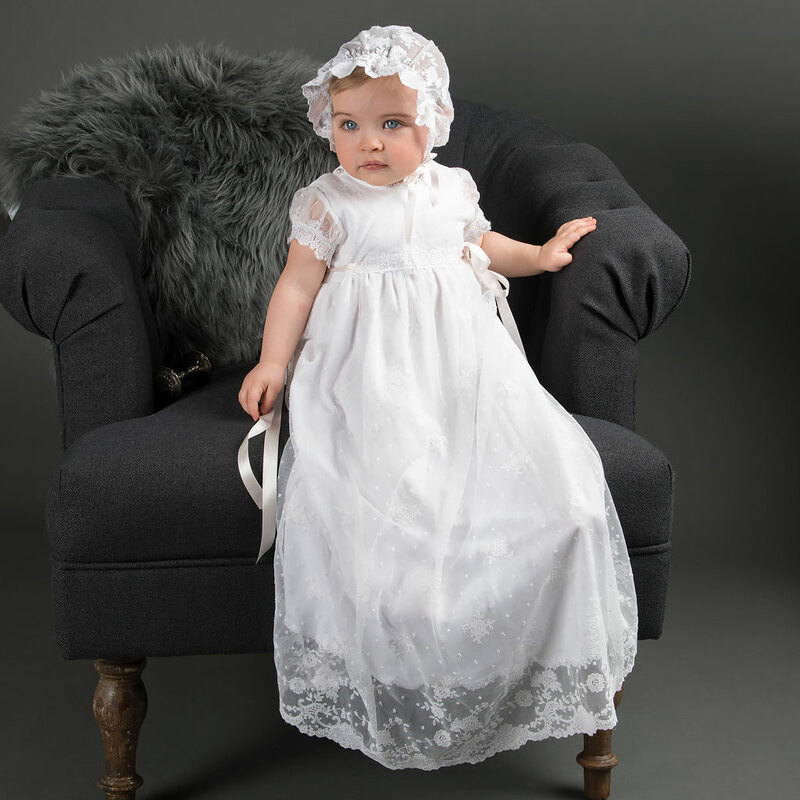 The collection also includes our Grace White Christening Gown - an heirloom quality dress featuring exquisite detail, made from a silk cotton blend in white, silk sash tie and matching bonnet. A gorgeous collection for a vintage look. A customer favorite for years, the Gwen collection is exquisite. Its lined with a super soft pima cotton in a traditional pure white color, so its very comfortable for your baby girl to wear for any special occasion. The white lining accentuates the ivory and champagne details of the gorgeous embroidered lace netting overlay. The netting lace is paired with champagne venice edge lace at the neck and sleeves, which add a vintage style that will seem as though it has been passed gown from generation to generation. . 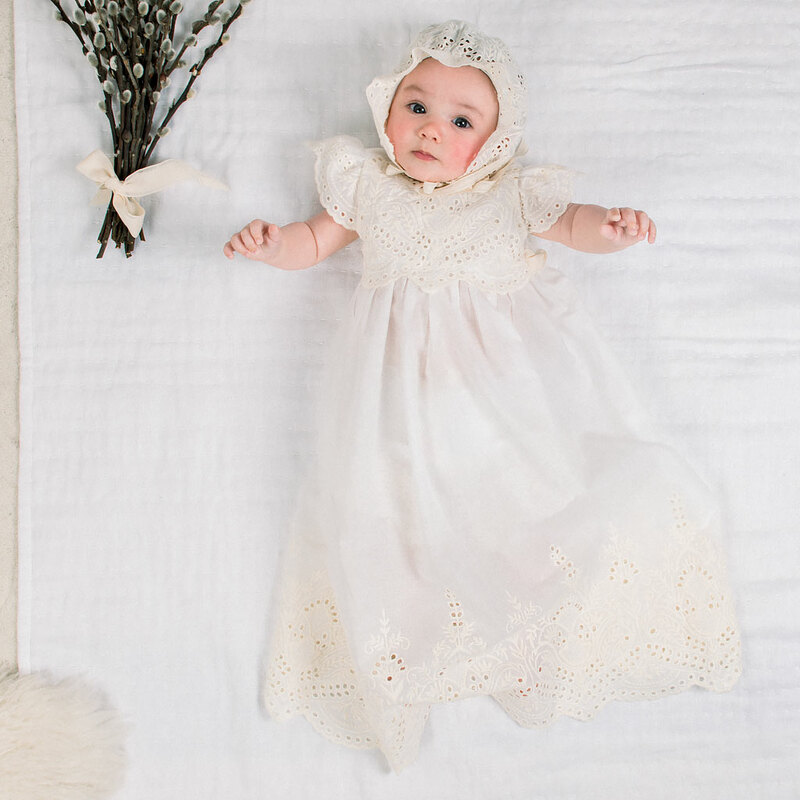 The Marita Hand Loomed Christening Dress is another exclusive found only from Baby Beau & Belle. Each bodice is hand loomed for us in Peru using only the finest mercerized cottons. The dress is then hand-made in the USA with our light ivory dupioni silk skirts. The newest design from the Baby Beau & Belle studios, the Olivia collection is incredibly unique and inspired. The Olivia romper is a short bubble length made in a soft white linen cotton blend with a finely detailed white cotton lace. The soft blue silk ribbon accent at the bodice is what truly sets this collection apart for your baby girl. A linen sash connected at the sides is as functional as it is beautiful- it creates a tailored look on her while adding a lovely bow detail in the back. The romper is finished with a peter-pan collar and is meant to fall mid-thigh or shorter. A true work of art, the Penelope Christening Collection was designed with no detail overlooked. The luxurious silk dupioni undergown is a pretty shade of ivory which accentuates the rich embroidered lace gown placed over it. The lace features beautiful floral embroidery in ivory with champagne cording that adds depth and richness, and ivory venice lace finishes the edge. Details such as handmade chiffon rosettes, cascading silk ribbons, and pearl button closures make this a timeless gown that will be passed down for generations. A pretty silk lined dress that is handmade in a simple design, yet with elegant and intricate details. Rich vintage ivory dupioni silk lines this gorgeous lace dress, with scallop lace details at the hem and bodice that are sure to impress. Comes with her matching lace bonnet so her look is complete. The Louisa Dress for Girls is as soft as it is beautiful! Made with a lovely 100% champagne cotton that provides a stunning contrast to the cotton ivory lace. Detailed with gold silk ribbon accents, hand covered silk buttons & hand sewn chiffon flowers. 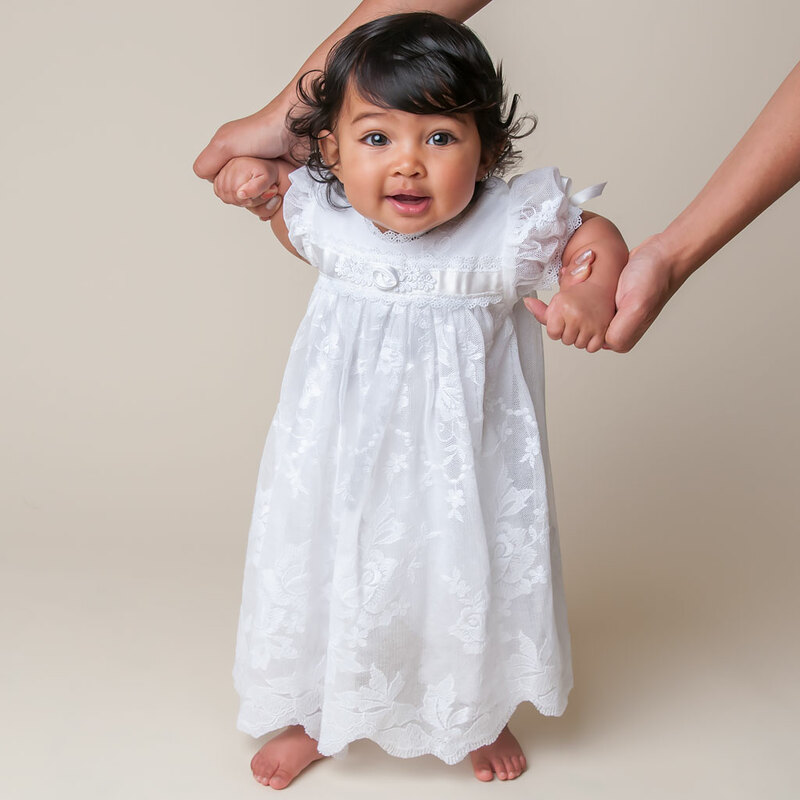 Our beautiful Ingrid Christening Collection offers a sweet, vintage inspired cotton gown. The Ingrid Gown features exquisite details in the embroidered cotton, and adorable design including cotton sash and scallop sleeves. This ivory and champagne gown includes her bloomers and bonnet for a complete outfit that will have friends thinking its an heirloom. The perfect collection for those of you who love little girls in pink! This beautiful collection is made with a vibrant pink cotton with a vintage natural cotton lace. Embroidered pink rosettes and olive green leaf are the perfect addition to complement the pink cotton. From the Natalie collection, we make a darling jumpsuit for all ages and a newborn layette that is made with a soft ivory pima cotton. Our Emma collection for infant girls is as unique as it is beautiful. The collection includes our new Emma bubble romper. The short romper is made with a fine linen and cotton blend, a soft and breathable material that is perfect for the little one wearing it. Detailed with ivory venice lace in a scallop and floral-leaf design across the front bodice. Light pink silk ribbon is woven through the lace for a gorgeous accent. The romper features a peter pan collar and is designed to fall mid-thigh or shorter. A sash, connected at the bodice sides, ties in back into an elegant bow - not only a beautiful detail but quite functional as it helps create a tailored fit on her. The Victoria Layette Gown is wonderfully soft with thoughtful silk and lace details that make it perfect for a special occasion. Crafted with soft pima cotton, known for its soft texture and heirloom quality. The bodice of the layette gown is layered with 100% silk dupioni in the loveliest shade of champagne pink and ivory embroidered lace. The silk creates a gorgeous contrast under the lace, highlighting the intricate embroidery. Sweet, lace cap sleeves and a gathered hem detailed with pink silk edging and ivory lace complete the design. One of our newest layette gowns for newborn girls combines our softest cotton with a functional newborn design. The Mia knot gown is made with 100% pima cotton, known for its soft texture and heirloom quality, in a lovely shade of champagne. 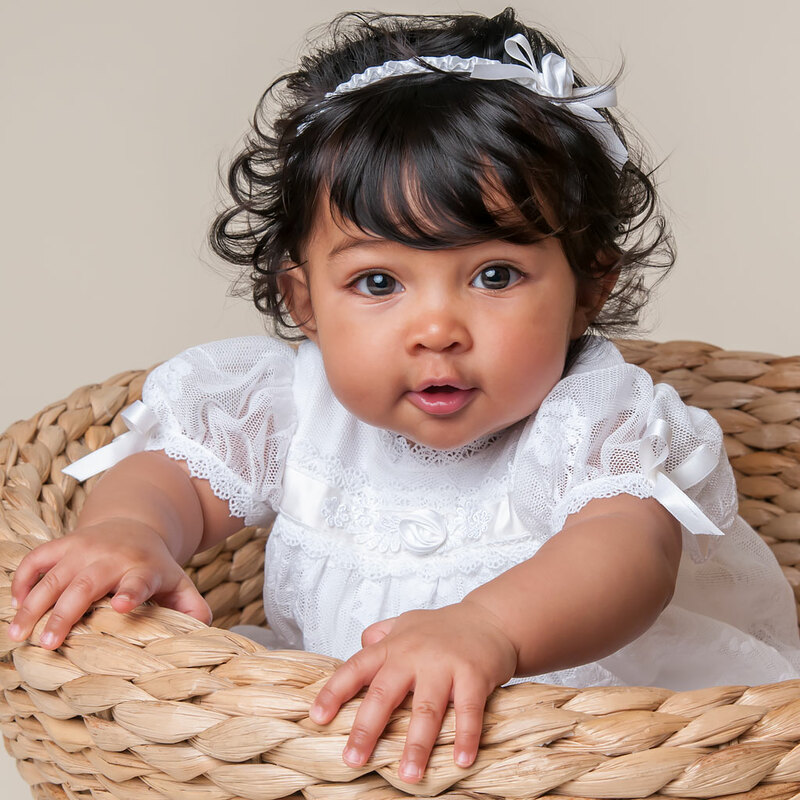 When purchasing our Joli Christening collection, you're receiving a christening outfit that is as soft as it is beautiful. A customer favorite for years, this baptism gown leaves no detail behind. 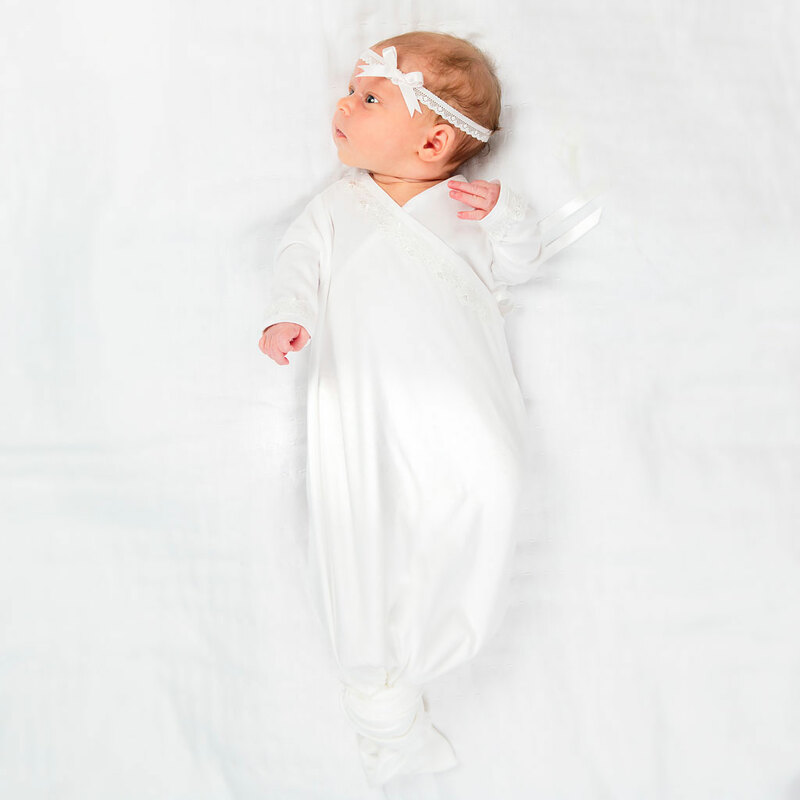 Its lined with a super soft pima cotton in a traditional pure white color, so its very comfortable for your baby girl to wear during her entire baptism day. A classic and timeless collection! Both the gownand the dress have an attached soft white pima undergown that is comfortable for baby, as well as a beautiful dotted swiss/floral border embroideredy. 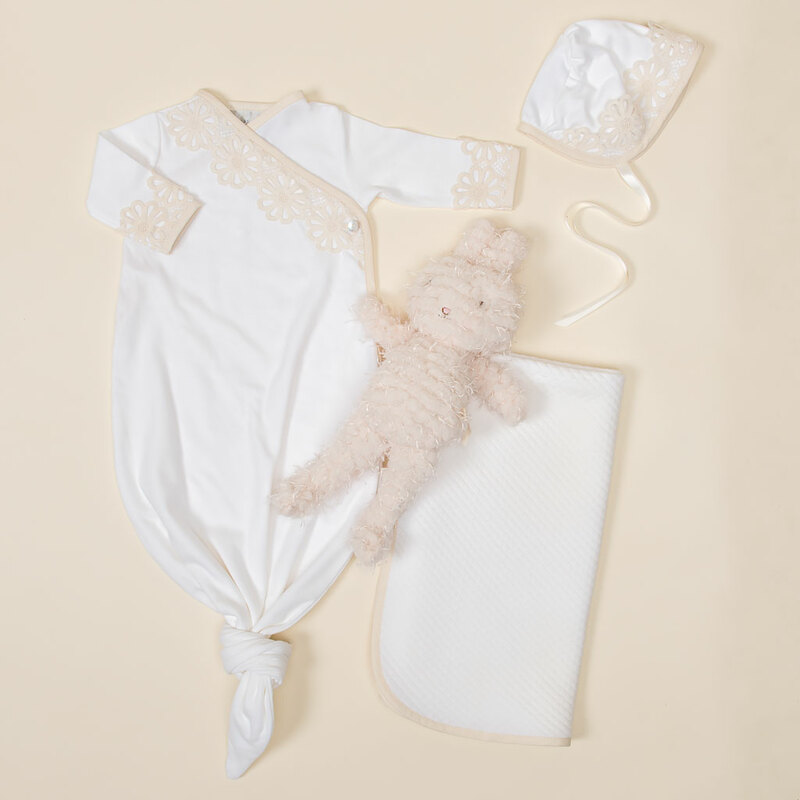 A simply sweet cotton layette gown for newborn girl christenings. 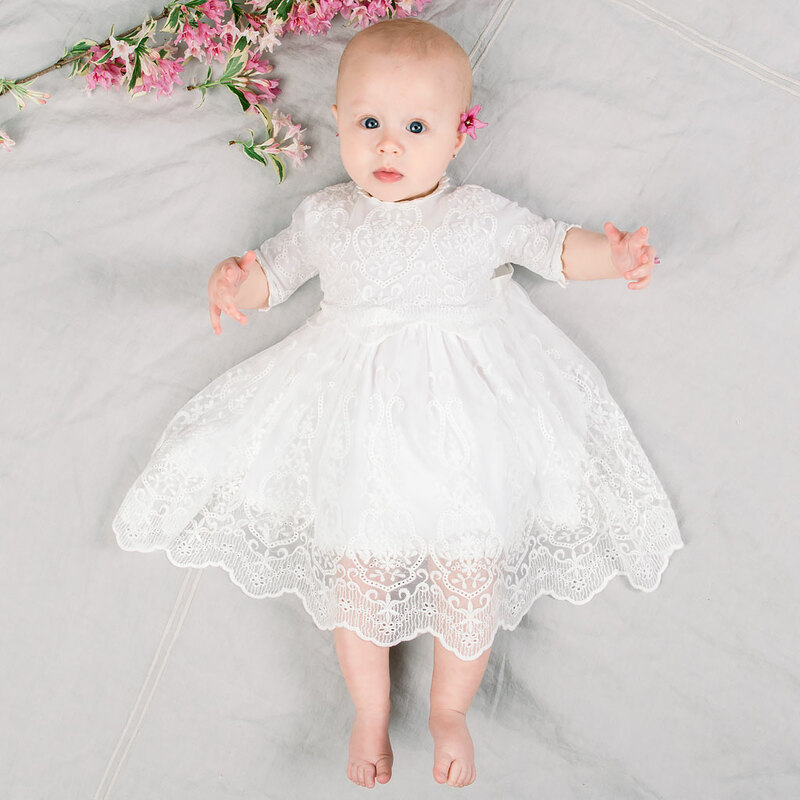 The Hannah knot christening gown is made with 100% pima cotton in pink and adorned with a natural floral lace. Includes the matching bonnet to help keep her warm. A great dress for a christening or for any special occasion. Lined in 100% cotton in white with a gorgeous, antique-inspired overlay white cotton netting embroidered with rose and vine pattern. Pair any of our matching Louisa white accessories to complete the look. The Louisa white collection is designed in house and made in the USA. The sweetest addition to our collection of Dresses for baby girls - the Eliza is soft and elegant for your baby girl. Featuring the Eliza Lace Dress which is crafted with a gorgeous light ivory floral lace and lined with our premium pima cotton. Darling mid-length sleeves are a beautiful detail. A silk ribbon sash helps to create a perfect fit. Add a unique vintage touch to her special day. Beautiful for a christening or any special event. Made with our beautiful embroidered mesh featuring a stunning vintage floral pattern. When shopping for antique gowns, the Chloe collection comes to mind, featuring both our soft pima cotton as well as our soft textured cotton and is trimmed with our vintage look Chloe lace. A lovely design for newborn girls that combines our softest cotton with a functional design for newborns. The Alice Knot Baby Gown is made with 100% pima cotton, known for its soft texture and heirloom quality, in a very light shade of ivory. Detailed with a beautiful floral lace on the front bodice and cuffs. This is an exquisitely crafted heirloom Baptism gown featuring a stunning richly embroidered lace overcoat. The Scarlett lace has a beautiful all over rose and vine embroidery in pink, champagne and white. Trimmed in ivory Venice lace with Ivory silk ribbon bows on the elbow-length sleeves. Neckline is accented with a handmade chiffon rose in pale pink, silk roses and leaves in white and champagne.